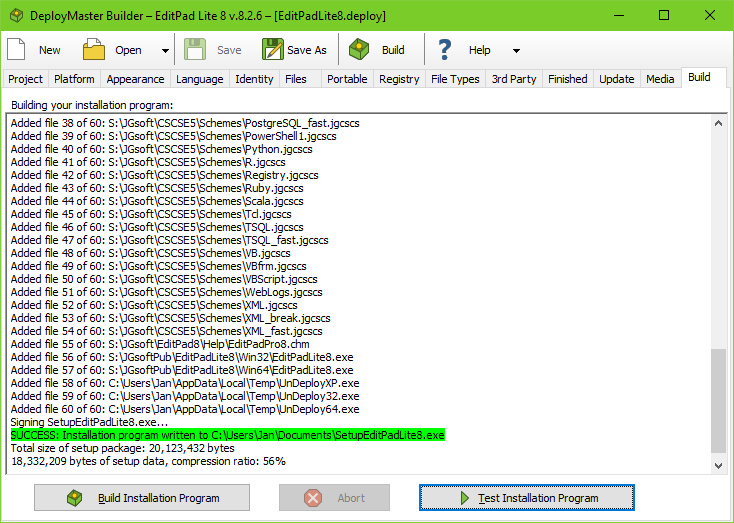 Click on the Build button in the toolbar to start generating the deployment package that will install your software. You can follow the progress on the Build page. Whenever DeployMaster detects something it does not like, it will issue a warning highlighted in yellow. These warnings do not abort the build process, but they do indicate that the built package will not be in optimal condition which may confuse the user. Fatal errors that do abort the build process are highlighted in red. DeployMaster uses the LZMA algorithm which achieves high compression ratios thus producing smaller setups that can be downloaded faster. But the LZMA algorithm is quite slow when compressing files. If your PC has multiple CPU cores (and your setup has as many files), DeployMaster will use all CPU cores while building your setup. The build log lists files when they have been written to the final setup.exe. If your setup contains files that are significantly larger than other files, then the build log may appear stalled at certain times while jumping ahead at other times. This is normal. Eventually all files will be written to your setup.exe and listed in the log. If you requested DeployMaster to digitally sign your installer, which you should, then you'll need an active Internet connection to successfully build and sign your installer. Digital signatures must be countersigned by a time stamping server to make sure the signatures don't expire. You can also build the package from the command line with the /b parameter. Use DeployMasterCmd.exe if you want to add DeployMaster to a batch file or a build process that uses standard I/O.